The Radebaugh family have been operating their greenhouse operations in Towson since 1924. That piece of the business was originally started by George W. Radebaugh. In 1940, the Radebaugh family added a floral design center to the mix. Both our greenhouse and floral design center remain in operation today and are open to the public for in-store shopping. Kaitlin Radebaugh, grand daughter of George W. Radebaugh, now runs the day to day business operations for both entities. 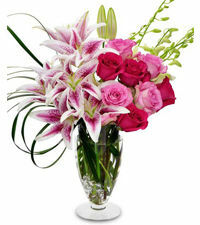 Radebaugh Florist offers local same day & express flower delivery service. We also provide nationwide same day flower delivery service for Towson area customers who need to send flowers, plants or a gift outside of the local area. Our local same day flower delivery service and our express flower service, come with our on-time delivery guarantee. We also back every flower arrangement we deliver with our 100% customer satisfaction promise. If for any reason you don't absolutely love the flowers we create for you, just contact our floral design center. We will replace those flowers with an arrangement of equal or greater value, free of charge. Radebaugh Florist offers the best variety of farm-fresh flowers in Baltimore and Towson. We carry all your favorites, including; Ecuadorian Roses, Holland Tulips, Exotic Orchids, Gerbera Daisies, Full Bloom Hydrangea and so much more. Our Ecuadorian roses are absolutely gorgeous. They are grown high in the mountains of Ecuador, where the plants enjoy the perfect blend of sunlight, soil conditions and moisture. Each rose is hand selected and cut special for Radebaughs. We are looking specifically for our roses to have longer stems and larger blooms. These roses make for a stunning display of color, style and panache when designed into an arrangement. Many of the flowers we sell are purchased direct from both international and domestic floral farms. Buying direct offers many great benefits for the customers we serve. When we buy direct, we are able to reduce the time between when the flowers are cut at the farms and when they are available to our design staff to use in creating gorgeous flower arrangements. Reducing that time frame is mission critical. It means that we can provide our customers with fresher flowers. A better quality, fresher product means that the folks who receive one of our flower arrangements are going to enjoy longer vase life from the arrangement they received.